As locks and security have advanced over time, there have been a large collection of individuals that have contributed to the overall improvement of home and commercial security. 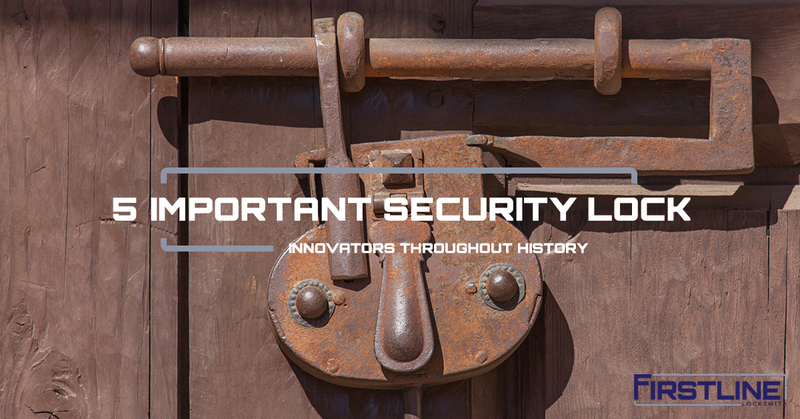 In this post, we’ll share the top ten security innovators throughout history, and explain how they contributed to the industry. If you’re in a “lockout” situation, give Firstline Locksmith a call today. We offer car, home, and safe locksmith services in Trenton. Instead of picking a random company online, let our 25 years of experience help you. A member of the Yale lineage that birthed Yale University, he is considered the father of modern security, due to his numerous patents and innovations surrounding locks and security. His father, Linus Yale Sr., passed away in the 1850s, which prompted Jr. to commit to the lock trade completely. He started his own company in the 1860s, and he invented what would later be known as the first pin tumbler lock design. You can still find modern Yale locks to this day. In 1807, Abraham was the first to receive a patent for the double-tumbler pin lock design. This patent was nearly 50 years before Linus Yale Jr., but Jr. redesigned the pin tumbler lock to improve it and got his own patent. Abraham’s patent alternatively describes his design as an “Egyptian Lock,” because it was based on research of the ancient locks from Nineveh. Barron’s development of the double-acting lever lock transitioned the lock security world forward from the warded lock. In 1778, Barron’s invention introduced the single, unique key, which disrupted the entire understanding of how locks worked. The warded lock was only effective if the person who wanted to get past the lock did not know how it worked. Once an individual knew how a warded lock worked, it couldn’t stop the person from entering the secured area. Barron’s invention shook up the industry and changed the trajectory of lock development. Primarily known as superior inventor during his time, Bramah had a knack for improving things. He actually sent Robert Barron a letter on how he could improve the double-acting level lock. Bramah went on to develop his own lock called the “Bramah Lock,” which can be compared to a modern day tubular lock, but it used sliders instead of pin tumblers. Due to the increasing abilities of lock pickers, Bramah, with the assistance of an employee developed “false gates” to throw off those “feeling” their way through picking the lock. Alongside Joseph Bramah, Jeremiah Chubb secured nearly three decades of locks that could not be picked. His invention of the Chubb Lock or the Chubb Detector Lock made it so if a lock was compromised, the owner would know. The Chubb Lock secured the internal lever if it were triggered by entry other than a key, which revolutionized the security of locks. Bramah’s knack for improving things paired with Chubb’s innovation created three decades of lock security unseen prior. If you’re in need of home or commercial security lock services, we can help. Our certified locksmiths have been serving Trenton and the greater New Jersey area for more than 25 years.